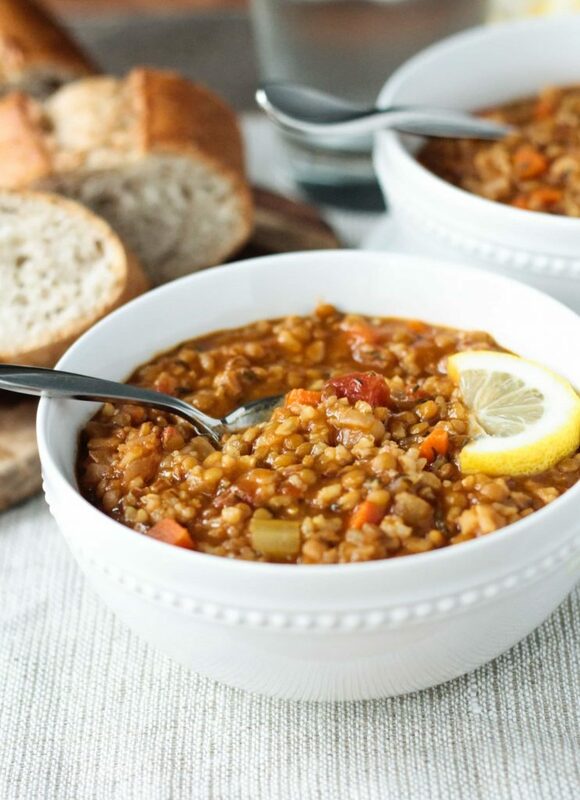 Lentil Rice Soup – A hearty, flavorful, protein packed and veggie loaded soup sure to warm your belly and your soul. Just want to let you know that this post is sponsored by Lotus Foods. All content and opinions are my own. It’s a weeknight, it’s cold out, you’re tired and the kids are cranky. (No? Just me?) You are craving a big bowl of warm hearty soup, but that would take hours, right? No! I know your grandmother used to simmer soup all day long, but it’s really just not necessary. This Lentil Rice Soup will take you about 50 minutes, but the majority of that is hands off time. Perfect amount of time to help the kids with their homework while this simmers away on the stove. Packed with protein, fiber, vitamins and minerals, this soup will warm your belly and your soul. Growing up, my mom was always the cook in our family (except for homemade pizza…I remember my dad doing that), but it’s my dad’s thoughts on food that I remember the most. He likes his food HOT – “if I’m not sweating, it’s not hot enough.” And I specifically remember two things about soup – if it’s potato soup it needs lots of celery salt and any kind of soup better be thick! None of those thin brothy soups for him. “If my spoon doesn’t stand up in it, it’s not thick enough.” LOL! Isn’t it funny the things we remember? 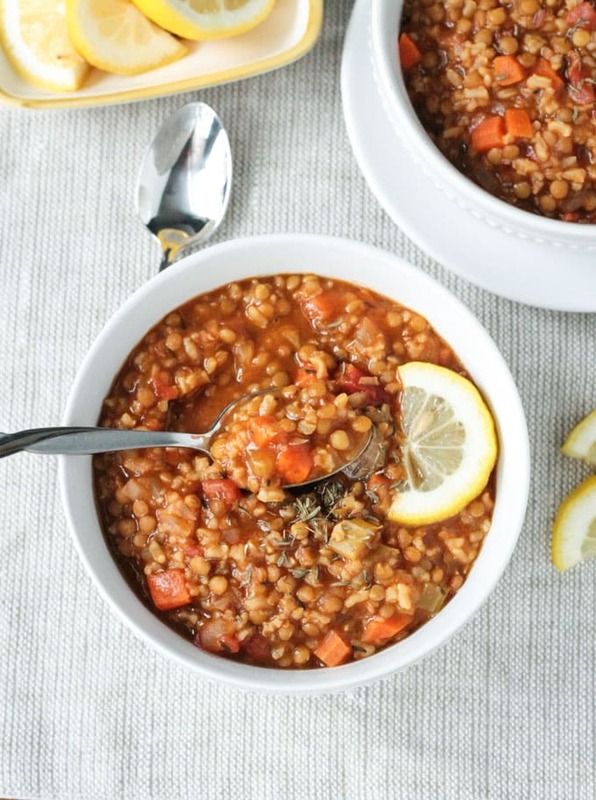 I tried the spoon trick in this Lentil Rice Soup and it just about worked!! 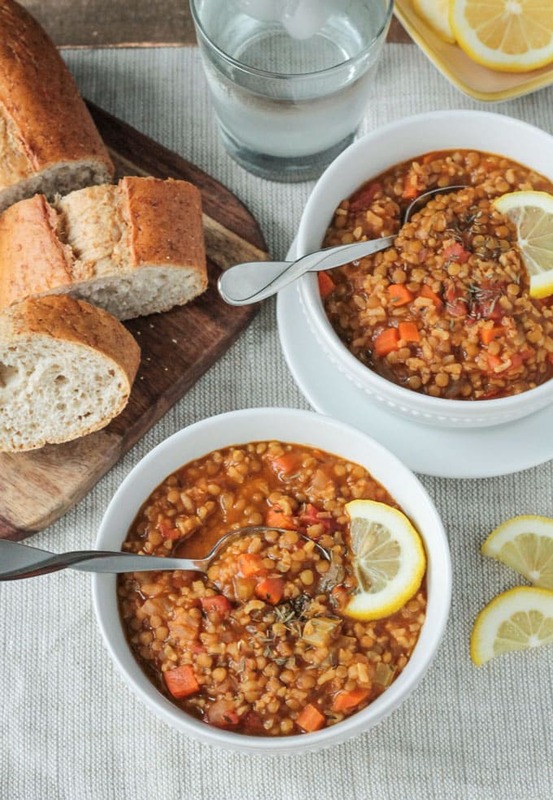 This is a hearty, stick-to-your-ribs lentil soup recipe! If you like your soup on the thinner side, never fear, a few extra cups of veggie broth will do the trick. I’ve been meaning to make a soup like this for quite some time, so when I was contacted by Meatless Monday, who teamed up with Lotus Foods, and asked me try out some of Lotus Foods’ product, I knew immediately what I would be making. The rice I used was their Organic Volcano Rice, which is a blend of Sintanur brown rice, whole grain red rice and lightly milled red rice. Focused on sustainable global agriculture, all of U.S. based Lotus Foods’ rice comes from small family rice farmers in developing countries. I really like what this company stands for and they have quite a variety of delicious rice products available, including Rice Ramen. This recipe makes a big pot of soup, so lucky for you leftovers taste just as amazing. Pack it up in a thermos and take it to work or send it in your child’s lunchbox. It does continue to thicken up as it sits (your welcome, Dad!) so you may need to add a cup or so of broth or water when you reheat. 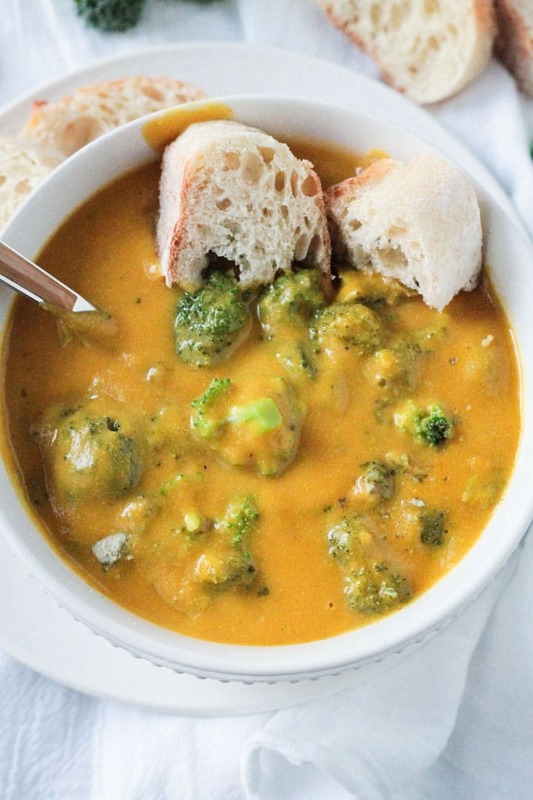 Grab a hunk of crusty bread to eat alongside this flavorful, protein packed and veggie loaded soup. Comfort food at it’s best! 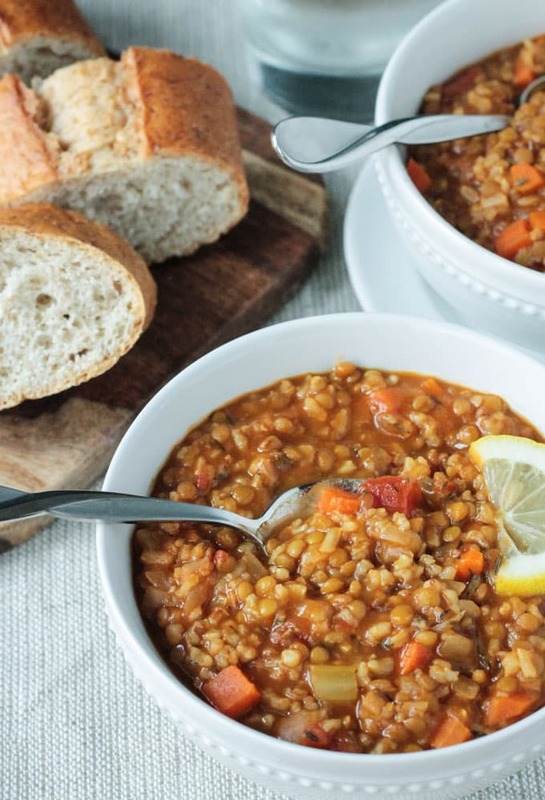 I hope you love this Lentil Rice Soup as much as we do. If you try it, please come back and leave me a comment below with your feedback. You can also find me on social media. Be sure to tag @veggie_inspired and #veggieinspired so I’m sure to see it. Enjoy! A hearty, flavorful, protein packed and veggie loaded soup sure to warm your belly and your soul. 50 minutes is all it takes and most of that is hands off time, making this the perfect winter weeknight meal. Saute the onion and garlic in 1/4 cup of vegetable broth for 5-7 minutes until tender. Add celery and carrots and cook another 5 minutes. Add lentils, rice, thyme, 1 tsp tamari, salt, pepper, tomatoes and broth. Bring to a boil, reduce heat and simmer 30-40 minutes until lentils and rice are cooked through, but not mushy. Take off heat, site in remaining 1 tsp of tamari and the juice of 1-2 lemons (to taste). ~This soup will continue to thicken as it sits. Leftovers may need to be reheated with another cup or two of vegetable broth. Also, how can I make this with brown rice and lentils that are already cooked? I have leftovers of each that i want to use in something. 1 cup dry lentils would equal about 2 cups cooked and 1 cup dry rice would equal about 3 cups cooked. If you have less than that, you can certainly scale this recipe down to fit your needs. Soup is a hard thing to screw up so you really can’t go wrong. Sauté the veggies per the directions in the recipe, then add everything else except the broth, including your already cooked rice and lentils. Then pour as much broth in as you want for the consistency you like. I would guess maybe 4-5 cups. You can always add more as it cooks. Simmer for about 15-20 minutes to heat through and give the flavors a chance to develop. Enjoy! How many servings is the nutritional information refereing to? The whole thing? 1/8th of the full recipe. #veggieinspired Tried this, used red lentils since I didn’t have green and twice the tamari, and cooked it in a pressure cooker high pressure for 18 min. Came out great! Wonderful! And glad to know it came out great in the IP! Thank you, Tom! Added a handful of kale to my batch and let it sit for 5 mins toward the end because I love my greens, and it was a great touch. Greens sound like a great touch! And so nutritious! So glad you liked it. Thanks, Hollyann! So, my husband, who is not a fan of soup or rice, said, “Surprisingly, this is pretty good.” That’s extremely high marks from him! I love soup and rice, and I absolutely loved the flavor/texture of this soup! I used the juice from a half of a lemon and it was perfect for us. Thank you for a soup recipe that both of us will want to eat again! HaHa, I love that, Sara! I’m surprised you got him to try it, but I’m glad he did! So happy you both liked it! I made this tonight. It was soooo good! Love new healthy soup recipes! Thank you! Yay!! I’m super happy to hear that, Susan! Thank you so much for stopping by too let me know! Enjoy the rest of your week! Oh, man. I love a good lentil soup! This sounds perfect! And that’s really cute about your dad and the spoon test. Those memories are so sweet. It’s funny because my mom was always the one who cooked, but I actually have more food memories about my Dad…I think because they were a bit quirky. LOL!! Thank you, Cadry! This looks so delicious, Jenn! 🙂 I absolutely love lentil soup and what a great idea to add rice! 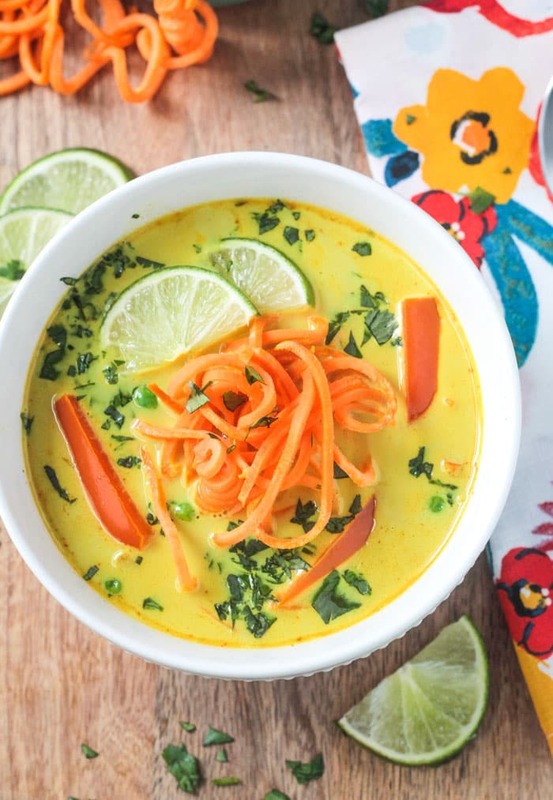 this looks like the perfect soup – so flavorful and satisfying! Thanks, Kristina! And it’s so thick, I’m thinking about using it to stuff some cabbage leaves!! Well, this is super healthy, so no need to hit the gum first! Which reminds me, I’m doing a 30 day pushup challenge and I haven’t done them yet today. Better get on that! Thanks, Howie! That looks glorious and a good reminder to get dinner started when you get home and leave it cooking. I had to laugh at your dad’s spoon standing up quote, my dad feels like that about custard, but my mum likes it thin. I remember them falling out over it once and being all huffy, it was hilarious. HaHa!! People are passionate about their food! I love it! And for the record, I like my custard thick too! 🙂 Thanks! Lotus foods makes such beautiful rice! This is such a great winter soup! Aw, yay for dads!! I am loving Lotus Foods products! Thanks, Rebecca! So, it’s not just my house then? LOL Thanks, Mel! Oh yes, crusty bread with soup is a must! Thanks, Levan! I’m always looking for a new way to fix lentils. Adding this to my list! Great, Noel. Thanks!! And me too….I love my lentils! Dads generally know best, don’t they? 🙂 Thanks, Gin! Thanks, Vanessa! And thanks for the PIN! I love lentils and rice together….so hearty! I hope you enjoy it! 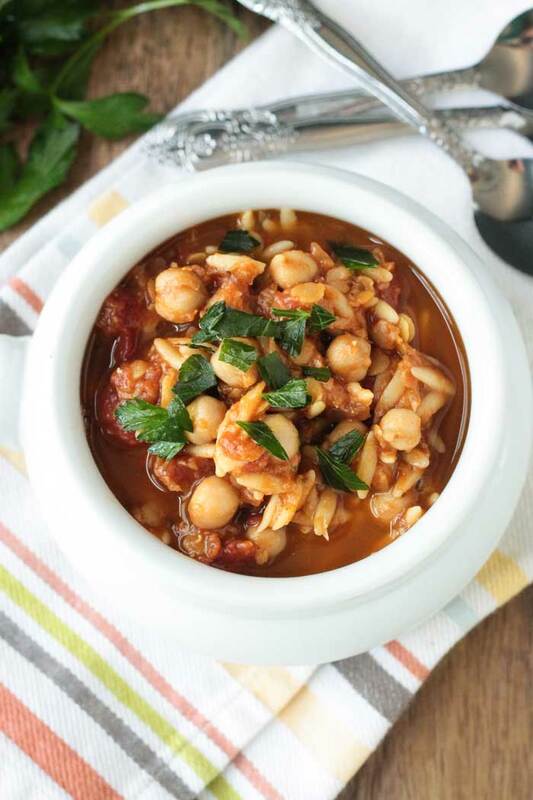 Love this hearty soup, flavors are right on! LOL!!! Nothing wrong with soup with the liquid all absorbed!! Just means more flavor IN the ingredients, right?! Thank you, Linda! Love soup so much! 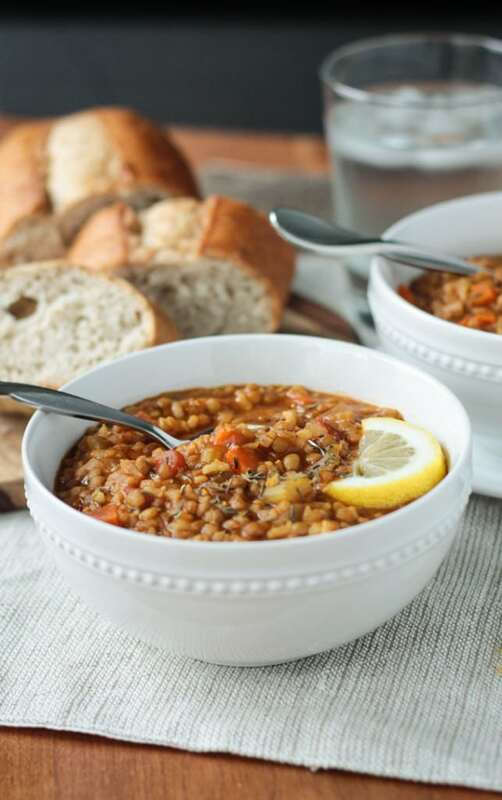 I especially love lentil soups, looks really hearty and delicious and I love every single ingredient. Great recipe! Beautiful soup! 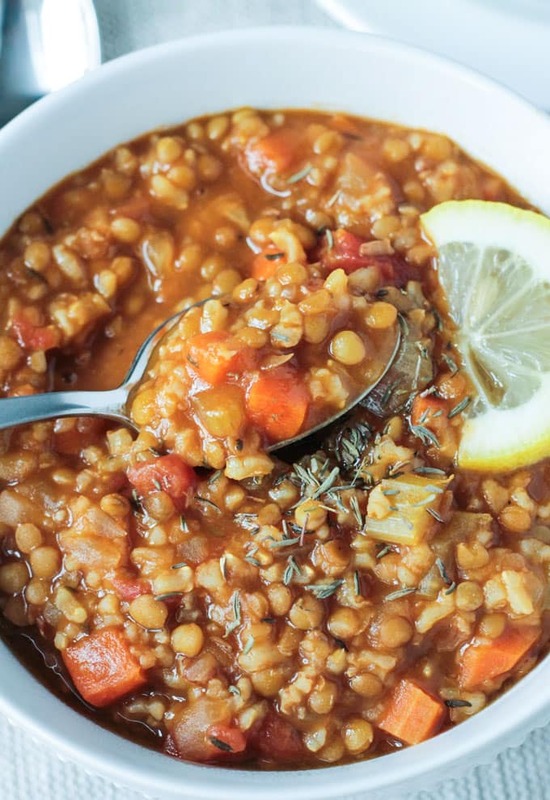 I grew up eating lentil soup, it is my favorite! Your pictures look amazing (I have those same white bowls.). Might have to fix me up a batch of this today! Lentils are the best! So versatile. Thank you so much, Danielle! I hope you enjoy it! Yay for another thick soup lover! Thanks, Lucie! Enjoy! This looks amazing Jenn!! I love thick chunky soups. I’l have to add it to my list of yumminess!! Thanks, Sophia! There has been a LOT of soup eating in our house lately!! Aren’t lentils the best? They’re filling, healthy and super tasty and I think for that, your dad should approve! HaHa, yes, Kelly! I think he would! Thanks! I LOVE lentils! I probably eat them at least 5 times a week. I just had some tonight, in fact. I think they are so versatile and, of course, incredibly healthy!